STOs, on the other hand, are providing a new form of fundraising and financing with properties similar to an Initial Public Offering, or private equities. Read the first article in our three part series on the development of blockchain in finance: here; and our second article on security token research: here. Read the first article in our three-part series on the development of blockchain in finance: here. Read the second article in our three-part series on security token research: here. This article is based on the recently published research conducted by our Chinese research team which received 800,000+ views across many Chinese media networks. The original article can be viewed here. The Warren Buffett approach of thinking long-term with the fundamentals is paramount to successful investing in the blockchain space. According to a 2018 report by Statista Inc., the global market for blockchain technology is predicted to reach a market cap of $548.2 million in 2018 and eventually a $2.3 billion market cap by 2021. 8 Decimal Capital is interested in companies using this technology to enact meaningful change rather than using blockchain as a buzzword. As we build the blockchain ecosystem through venture capital investment, we are especially interested in companies that combine blockchain and cryptocurrency technologies with a powerful and compelling use-case. Through a comprehensive due diligence analysis focused on three core business areas — underlying technology, management team, and industry sector outlook — 8 Decimal is committed to building the blockchain industry with a foundation-first investment approach. One of the specific areas of blockchain technology that 8 Decimal Capital is quite bullish on is the Security Token space. There is an opportunity for Security Tokens to drastically change the traditional financial industry. Security Token Offerings (STOs) are considered to be a new and improved Initial Coin Offering (ICO). As LindaCrypto and Hackernoon report that participating in an unregulated ICO is risky and volatile, “ICO Terms state that the project is a high-risk investment and it might fail.” STOs, on the other hand, are providing a new form of fundraising and financing with properties similar to an Initial Public Offering, or private equities, where “a company issues security tokens to investors [or] asset-backed IOUs and can be considered legally binding investment contracts that give investors access to a share of the company, a monthly dividend or a voice in the business decision-making process.” STOs provide investors with more flexibility and efficiency. As the value that STOs can provide to investors and companies is still being created, 8 Decimal Capital remains bullish on the value these processes can bring to the blockchain and cryptocurrency industry in the near future. We believe that industry players, venture capital funds, and related capital providers will maintain the desire to assist in progressing the digital world. 8 Decimal Capital is looking for an evolution rather than a revolution: to change the analogue world into a hybrid digital world instead of directly going into a purely digital world. This hybrid world combines the traditional business world with new technology without completely replacing current business structures. This will allow for steady and sustainable growth of blockchain technology. 8 Decimal Capital has realized that successful investment is the result of building a foundational groundwork. We invest in public chains and protocols to help build up the infrastructure layer. Eventually, we expect infrastructure layer technologies to be leveraged in the creation of dApps and consumer-facing applications. In addition to investment at the infrastructure layers, we have invested in the blockchain financial ecosystem too. Investments have been made in exchanges, stable currencies, Security Token service providers, payment platforms, and lending platforms. We form strategic alliances with many exchanges, media outlets, consultancy services, and developer communities to support our investment portfolios with resources and a powerful network. 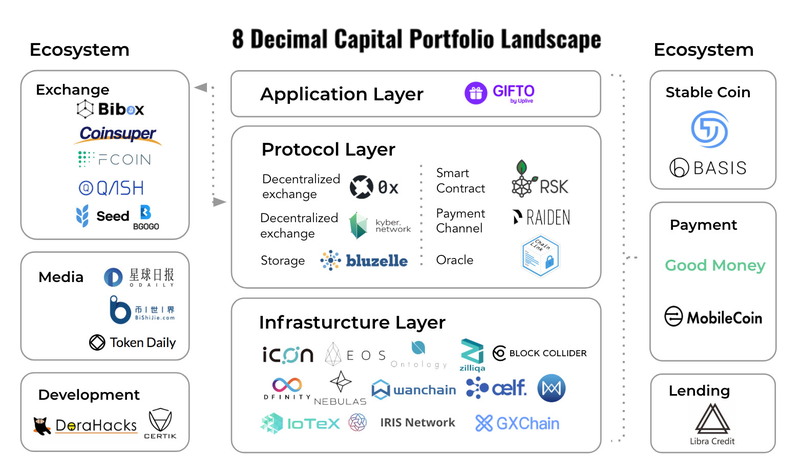 Through prioritizing a full-ecosystem investment strategy, 8 Decimal Capital is shaping the blockchain future by supporting pathways for the old and new business worlds to take full advantage of blockchain’s potential. Email: contact@8dcapital.com if you have any more questions about this topic. 8 DECIMAL CAPITAL is a multi-strategy investment firm focusing on token and equity investments. 8 Decimal currently has more than 40 portfolio companies with an AUM of 60M USD. The investment team consists of more than 10 venture capital veterans, researchers, and trading professionals. The advisory board comprises Fan Zhang (Former Founding Partner of Sequoia Capital China), Karen Chen (Former CEO of UBS China) and Ben Bartlett (Vice Mayor of Berkeley). Based on the professional fund index ranking agency Token Metrics, 8 Decimal was ranked second out of the 51 active crypto funds. 8 Decimal is also well-received in China, named one of the top 10 funds in the blockchain industry by both 36氪（36Kr.com）, Chain Capture , and Odaily, as well as named one of the top 20 funds by Tsinghua X-Lab and Youth Education Chain League. 8 Decimal Capital is a multi-strategy investment firm focusing on both token and equity investments.